What comes to mind when you think of Europe? If images of the Eiffel Tower, the Leaning Tower of Pisa or the Colosseum flashed before your eyes – you wouldn’t be alone. Such colossal monuments can give us a glimpse into eras as far back as the Roman Empire and are world-renowned symbols of Europe. But what really characterizes Europe? It’s what the Ancient Roman’s bathed in, The Berserker Vikings drank before battle, and the Greeks and Spaniards offered their Gods during ritualised festivities – it is an exquisite drinking culture that is deeply woven into European society, and continues to be embraced and celebrated today by locals and travellers alike. Travelling around Europe today, a strong drinking culture and appreciation for beer and wine can be seen everywhere. You can enjoy champagne at a bar at the peak of the Eiffel Tower, down an ice-cold lager at a pub in front of the Colosseum, or sip a glass of wine at one of the many Parisian style cafes and bars dotted around the Vatican City. If you truly want to appreciate European culture – emerging yourself in their timeless drinking culture is a must. That’s why Thirsty Swagman, Australian-based Tour Operator, offers a unique perspective on tours through Europe, taking thirsty adventures on an epic journey to all the best nightlife destinations in Europe. You’ll experience each destination as the locals do, seeing Europe through the bottom of your glass, and all with a crew of 25 strangers who are sure to become your mates for life. Thirsty Swagman’s tours take travellers to only the most mind-blowing and unique destinations in Europe. With one tour taking travellers to a tiny Gothic town in the heart of the Austrian Alps where you’ll stay in dreamy cabin lodges and spend a day at a privately owned chalet nested 4,000 feet up the mountainside, worth about $8 million. And the view – priceless. Here, the thirsty crew bonds over food, beer and breathtaking panoramic views of the entire town and its domineering surrounding Alps. And as nightfall hits – you’ll be in for a wild ride of Schnapps, AC/DC, and drink servings of Redbull Vodka’s by the metre (wooden racks of 10 drinks at a time). Think that sounds incredible? You’ll also spend three wild nights at Germany’s famous Oktoberfest in Munich – each tent representing only traditional Munchen breweries. Step inside and you’ll be blown away by each tent’s different themes, giving you an unique and elaborate spread of colours and decorations to drink under. The view is a spectacle you’ll never forget, as 10,000 travellers and locals alike, rock out in traditional German attire and raise their steins in synchrony to a traditional German Brass band playing “Ein Prosit”, a simple melody that literally translates to “a toast”. Done downing beer in Munich? Why not partake in the wildest food fight on Earth, at La Tomatina, Spain. This is one country that passionately embraces their drinking culture – with a hearty meal not considered complete without the right kind of beverage, and numerous festivals centred around a timeless appreciation for wine. In Spain, you’ll venture to a small (and virtually unheard of) village-town called Buñol, where you and 40,000 partygoers will step onto a narrow street and prepare to paint the walls red with truck-loads of tomatoes before you head to infamous party-island – Ibiza. 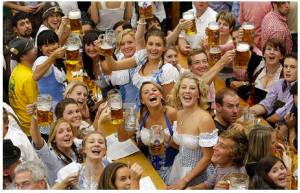 Thirsty Swagman is the world’s first tour operating company to offer international pub crawls that will have you toasting, guzzling and dancing as you experience Europe through the bottom of your glass. With tours now heading to 8 mind-boggling destinations across Europe, it’ll be an experience of a lifetime – even if you only remember half of it. Shot up to some local vineyards for a grape stomp and BBQ. We took a tractor ride through the beautiful vineyard and jumped into the mess. I actually had someone tell me there were going to make a marinade out of the juice…. Gross!